Three detectives track a serial killer to the gates of hell. Detective brothers Sean (Damon Carney) and David (Randy Wayne) Carter with Detective Christine Egerton (Alexandra Harris) track down a murderer killing people by the Ten Commandments. The closer they get to finding this godless monster, the closer they get to finding out what real evil is. “Evil seeks evil” and judgement is coming. Hell comes to earth in the latest edition of the Hellraiser series. Pinhead is replaced once again for the tenth installment of the thirty year old franchise. This time around longtime Hellraiser effects artist Gary J. Tunnicliffe who also wrote the last film Revelations slips into the director’s chair for the first time. Tunnicliffe also takes the lead Cenobite role as one of the film’s most intriguing characters. Reportedly made on half the budget of the original film thirty years ago, most feel this first edition of the series made in several years was to keep ownership rights in the hands of Dimension films and away from series creator Clive Barker. Tunniclife still shows his passion for the project even if feature film quality is traded in for a television level production. For the second time Pinhead is recast. Paul T. Taylor does a surprisingly acceptable performance both looking and sounding the part. 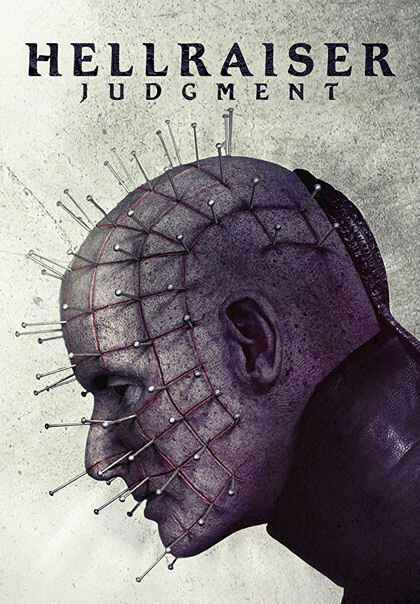 Though director Tunnicliffe has been working his special effects magic on Pinhead since the third installment, I still say the original film and follow-up sequels have a better looking Pinhead. New Cenobite designs and some revisited favorites are a success though, even if the mouth movement doesn’t always match the voice. The original film is an exploration of the primal cruelties of humanity and the torture of the human soul. Subsequent sequels mostly fell into focusing on the Cenobites and torture, thinking that’s what their audience wanted. Tunnicliffe tries to recapture that original vision of Barker’s world. Lemarchand’s box is less about opening the gates of hell and used more as a blunt object in this less human, grosser version of Hellraiser as creepiness is traded for gore. It isn’t always best to evolve a story that could instead be repeated in various forms with far more entertainment value. The final judgement of Hellraiser: Judgement? There are excellent scenes to gross you out. The opening alone is unexplained brilliance. Paul T. Taylor is a successful Pinhead for anyone willing to give him a chance. There are fun cameos of Nightmare on Elm Street’s Heather Langenkamp and Feast director John Gulager who proves himself to be disgusting as the Assessor. Tunnicliffe wrote himself the most successful role as the Auditor in the best Cenobite addition I’ve seen in ages. With the last two franchise films written by Tunnicliffe, he’s proven he’s a great idea man but may need help rounding out a complete story. Biblical references and our first glimpse of Heaven in Hellraiser, does leave some holes and glaring mistakes. Hell is traded for a grungy earth with Saw and Se7en taking Hellraiser form for our earthbound story. This film would have fit an unrestricted television series better than playing out as a feature. There’s still some gross-out gore and for the first time in a long time I can see the passion behind a Hellraiser film. Stick around after the credits for die zugabe.